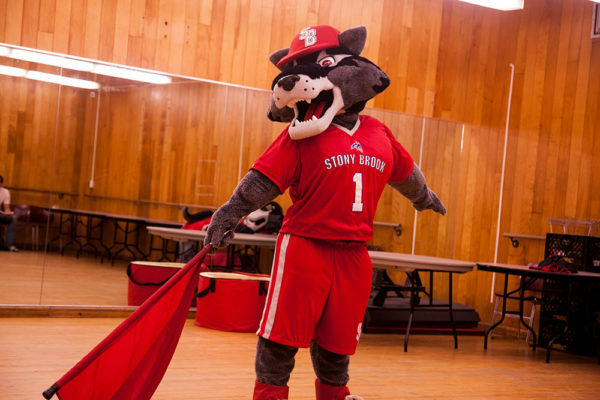 Stony Brook Athletics has requested the names of tryout participants be withheld to prioritize Wolfie as a character over the men and women behind the mask. Tryouts to select the next wave of Stony Brook’s mascot Wolfie were held in the Indoor Sports Complex on Wednesday, Sept 27. The eight students hoping to join the Wolfiepack awaited their shot to wear the costume outside a basement dance studio in an austere hallway of brick and tile. The would-be Wolfies passed time by looking through their phones and laptops, reviewing their routines as marching-band music sounded through the door. Students were called one-by-one into the dance studio, where they soon realized the tryout’s bark was worse than its bite. Aspiring Wolfies were suited up and run through a series of basic tests: jogging around the room, doing a push-up and pointing out the mascot’s ears, as well as handling hypothetical situations. Their attempts were reviewed by a panel of judges working for Athletics. Andrea Lebedinski, assistant director of Seawolves United and donor stewardship, said selecting a mascot is an issue that affects more than just the morale at home games. Wolfie, she argued, is synonymous with Stony Brook University itself; his feats and failings will inevitably reflect on the college’s brand. Students ended the tryouts with their own one-minute routines meant to showcase each individual’s talents. Wolfies danced and dabbed, twerking and twisting their bodies in a unity of flesh and fur. Following his trial by fire, one student reflected on how it felt to step inside Wolfie’s shoes, even if only for one glorious moment. Students will find out whether or not they made the cut over the next few days. A lucky few will be brought on as actual Wolfies. For the rest, there is always next semester.